The Roman Empire was the first global empire to have a lasting impact on the system of trade and commerce that emerged in later centuries. Among the remnants of the Roman Empire in society is mythology. While most of the world’s population follows established religion, Roman mythology is a topic studied to this day. 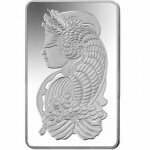 PAMP Suisse pays homage to Roman mythology with its popular 10 oz PAMP Suisse Fortuna Silver Bar. 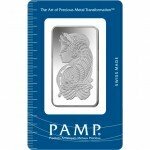 You can now buy one of these 99.9% pure silver bars from Silver.com in brand new condition. In Roman mythology, Fortuna served as the goddess of fortune and the personification of luck in Roman religion. Romans believed that Fortuna was capable of bringing both good and bad luck to those who worshiped her. She is often depicted with a veil over her face or blindfold over her eyes, a depiction that is often found in modern personifications of justice. Her father, Jupiter, was the king of the gods and was better known by his Greek name: Zeus. On the primary face of the 10 oz. 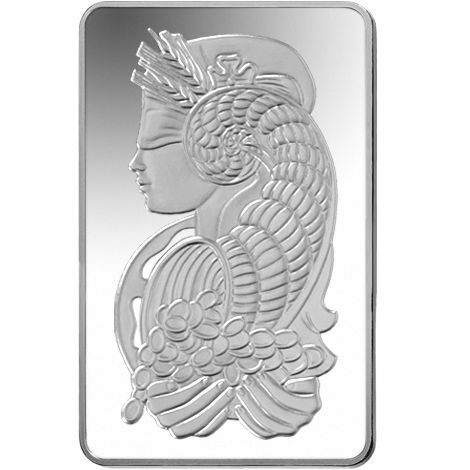 PAMP Suisse Fortuna Silver Bar is the depiction of the goddess. She is featured in a left-profile portrait with a blindfold over her eyes. The cornucopia on her head twists down toward her cupped hands, with a vast fortunate overflowing from the cornucopia and into her hands. There are no other engravings on this side of the bar. 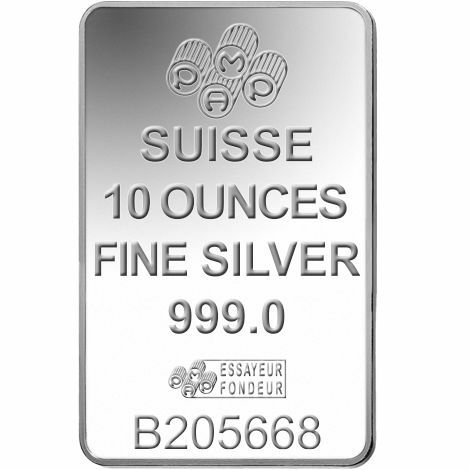 The opposite side of the bar features the identifying information of the 10 oz PAMP Suisse Fortuna Silver Bar. Engravings on this side include the corporate name and logo, weight, metal content, purity, individual serial number, and the assayer’s mark. Like other mid-weight bars in the Fortuna series, this silver bar features a slightly raised edge around the rim of the bar. PAMP Suisse was first established in Ticino, Switzerland in 1977. 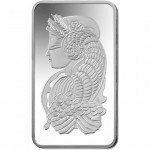 The company quickly established itself as one of the preeminent brands in the world bullion marketplace. Today, as part of the larger MKS Group, PAMP operates a state-of-the-art precious metal refining and fabrication facility. The MKS Group is one of the world’s largest precious metal and financial services firms, with the parent company located in Geneva, Switzerland. 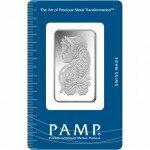 If you have any questions about this 10 oz PAMP Suisse Fortuna Silver Bar or the online purchasing process before placing your order, we invite you to contact our associates at 888-989-7223. You can also reach a member of the Silver.com staff through the live chat feature online.